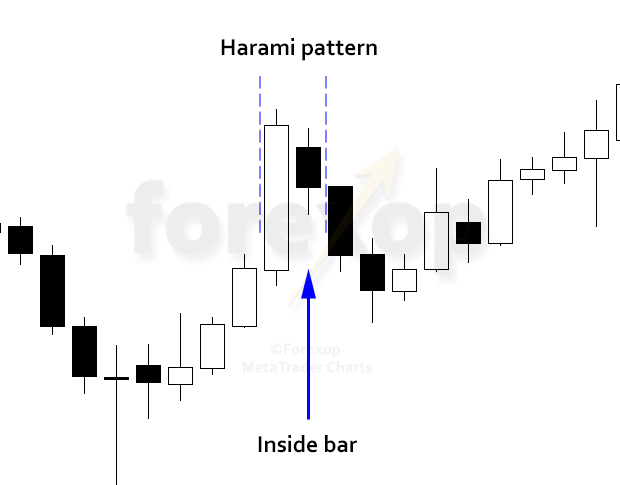 A harami is a candlestick pattern that’s often a subtle clue that a trend may be due a pullback or at least some price consolidation. Basically speaking a harami pattern marks a sudden break in a trend where there’s indecision. At this point the buyers and sellers are closely matched so there is very little rise or fall in the price at that time. Haramis can be traded in either of two ways. The first is as a short term pullback strategy where a trader aims to profit from the downswing or upswing that happens after the pattern forms. The second is as a classic trend following strategy where the trader uses the harami (and often other signals) to time their entries into the trend. Haramis are subjective patterns so it can take a little practice to identify them and understand their meaning. When looking for a harami we look for two candlesticks: the first must have a large body and the second (the later one) a small body that is enclosed entirely within the larger candle. This is sometimes known as an “inside bar” configuration because the triggering candle must be entirely inside the bigger candle. In fact that’s the meaning of the word “harami”. 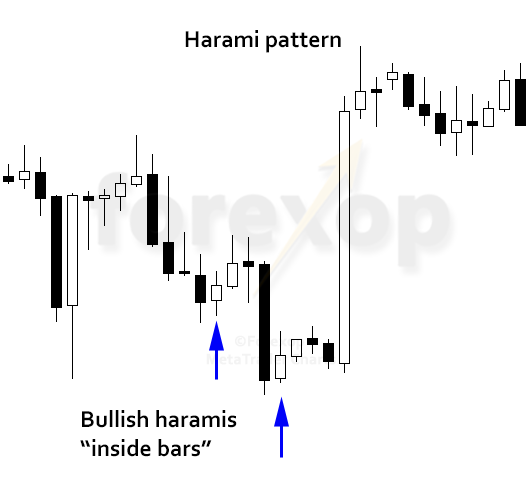 A bearish harami is a sign of a down swing and usually happens in an uptrend. A large white bodied candle is followed by a much smaller black candle that’s inside and typically aligned around the center of the white candle. The bullish harami is just the opposite. It occurs in a downward trending market. The harami is then formed when a large black candlestick is followed by a small, white candlestick that’s entirely “inside” the black one. 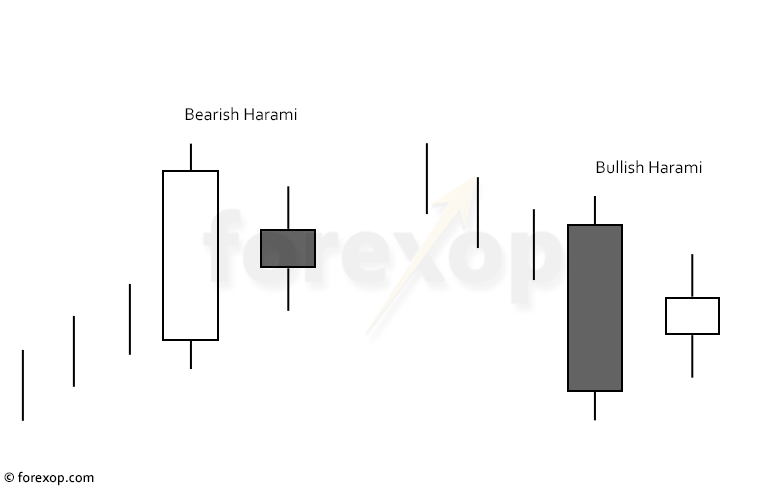 With either the bullish or bearish harami the body of the small candle should be completely inside the bigger candle. The shadow (high and low) of the inside candle should also be within the high and low of the outside candle. Some traders are more flexible on this second constraint and allow the shadow of the small candle to extend above or below. The other point to keep in mind when trading 24 hour markets such as forex is that on the daily chart, the close of the one candle will usually be at or close to the open of the next candle. This is unless they cross a weekend. That means on the daily chart you’re less likely to see big gaps between candle openings and closings as you are with stock charts. The quality of the harami can depend on the discrepancy between the candle sizes. This is because the harami generally symbolizes an abrupt change or indecision within the market. If the candlesticks are roughly equal in size, the interpretation is more uncertain. A variation of the harami is the harami cross pattern. With a harami cross, the inside bar is a flat candle known as a doji. A doji is a candle without or with a very small a body, but with an upper and lower shadow. Let’s look first at a bearish harami. The bearish harami denotes a drop of upward momentum and potentially a change in bullish sentiment. This might indicate a reversal in the trend direction or more likely a short term pull back. In either case the bearish harami can be used as an extra piece of information on which to either enter the market short or to exit long positions. The example in Figure 2 shows a long doji candle that marks the end of a bearish trend and the start of a new bullish trend. This is the daily chart (USD/JPY). The four days of strong gains culminate in a long bodied white candle. At this point momentum starts to drop off sharply as buyers are contemplating whether the bearish trend will reassert itself or if the market is turning bullish. At this point, the long white candle is followed by a black “inside” candle and this completes the harami inside bar setup. Notice that the high and low of the black candle are complete inside the white candle. This denotes a drop in bullish interest. This harami pattern happened over a weekend. So the black candle was the first opening for the week, and this opening showed a marked change in sentiment. In the long run this harami didn’t mark a change in overall bullish sentiment. Rather it simply flagged the start of a brief consolidation as the market started to give back some of the strong gains that had been made previously. An example of a bullish harami is shown in Figure 3. Here two harami patterns appear in a strong downtrend. These are marked with blue arrows. Both of these are followed by a brief retracement of the bearish trend as the price recovers some of the losses. In both of these the recovery is short lived because the bearish trend does resume again. In this instance the bullish haramis signal only a brief recovery rather than a major change in sentiment. As the examples above showed, a harami can often just be a sign of indecisiveness in the market. The small bodied “inside candle” marks a turning point; here buyers and sellers are evenly matched and this causes the price to remain fairly static. This is why the inside bar is typically a good trigger to look for when trading short term market swings. 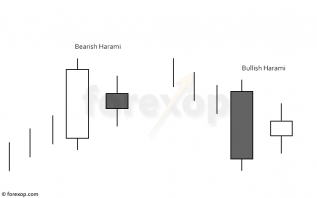 For example in Figure 2 a trader could use the bearish harami signal as a point on which to enter the market long. That is buying the dips. 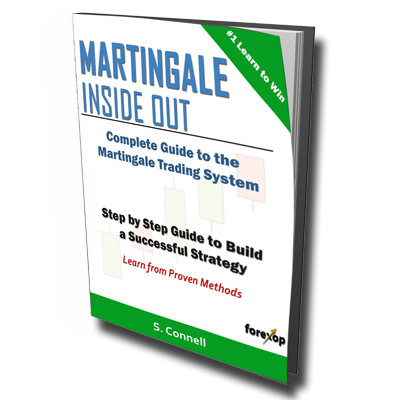 A swing trader might enter short on the harami signal by looking to profit from the pullback. If the harami were instead a bearish engulfing pattern, generally seen as a stronger signal, we might be more wary that bearish sentiment is more firmly rooted.